1 Shelly and Brian followed Ms. Brush down a carpeted hallway into another room in the museum. The first room they had visited had been full of paintings done in the style called pointillism. Dots and more dots! The painting they had discovered in Aunt Rayna's attic was not made of dots! So they continued on their search to figure out who had painted their great-aunt Rayna's mystery painting! 2 "I'm hungry!" said Brian. 3 Shelly rolled her eyes. It was only eleven o'clock. Here they had this great puzzle to figure out, and her brother got hungry in the middle of it. It seemed like Brian was always hungry! They had packed a picnic lunch with tuna fish sandwiches this morning. They had also packed crunchy carrots, ranch dip, bottles of water, and apples. Shelly wanted to go through one more room before stopping for lunch. She didn't think she could stand to wait one more minute to solve the mystery! 4 "I guess we could take a break for lunch," said Ms. Brush. "Come by my office when you are done, and we will finish our tour." 5 "Thanks for your understanding of a hungry boy!" said Great-aunt Rayna. She led the children into a courtyard with concrete benches and paved paths. There were flowers everywhere. 6 "Hey, look at this neat fountain!" said Brian. There was an oval pool that had a statue of a mermaid in the center. Out of the mermaid's mouth came a stream of cold water that spilled into the pool. Spotted koi fish swam in circles through the bubbles as if they were having fun. Many coins were scattered around the bottom of the pool, safe, for now, from being spent. 7 Aunt Rayna, Shelly, and Brian sat down and ate their lunches. They talked about pointillism and how much patience it must have taken for the artists to make thousands of colored dots on their canvases to create their art. Soon, they were finished, and Shelly looked relieved! 8 They met Ms. Brush at her office. She took them into another room in the museum. 9 "Wow, what a mess!" exclaimed Brian. "Did this artist have an accident or something? Why is this in a museum?" 10 Brian was looking at an enormous canvas with ripples of paint crisscrossing it in all directions. It looked exactly as though someone had thrown paint at it! 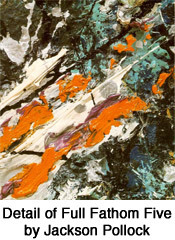 11 "This painting was done by a modern artist named Jackson Pollock," said Ms. Brush. "He liked to show his emotions in his work!" 12 "Was he upset or something?" asked Brian.